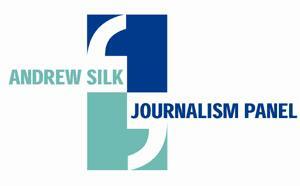 On Saturday, April 2, from 10 a.m. to noon, the Andrew Silk Journalism Panel at Haverford College will convene in the Zubrow Commons, Marian E. Koshland Integrated Natural Sciences Center. This year's theme, for students and teachers and all those interested in journalism, will be "Political Coverage in a New Media Environment," and will feature Michael Wolff, a Vanity Fair magazine media columnist, best-selling author, and TV commentator; Steve Goldstein, national correspondent for The Philadelphia Inquirer in its Washington Bureau; and Duncan Black, writer of the Eschaton blog at http://atrios.blogspot.com. The late Andrew Silk's brother, Mark, will be moderator. Andrew Silk was a 1976 Haverford graduate and talented journalist who died in 1981. The panel has convened for the past 18 years, supported by the Silk family, and in the past has addressed such topics as "Religion in the News"; "9/11"; "Tabloidizing the News: Journalism in the Age of O.J. and Diana"; and "The Impact of New Technologies on the Media". Distinguished panelists in the past have included religion reporter Michael Paulson '86 of The Boston Globe; Stephen Engelberg, Deputy Foreign Editor of The New York Times; Juan Williams '76, of NPR and Fox News; Robert Mong, ' 71, president and editor, The Dallas Morning News; David Wessel '75, "Capital" columnist for The Wall Street Journal; Joe Quinlan ' 75, of Time/Warner; Steven Bronstein ' 75, producer of "Inside Edition"; and Andrew Heyward, president of CBS News, among many others.